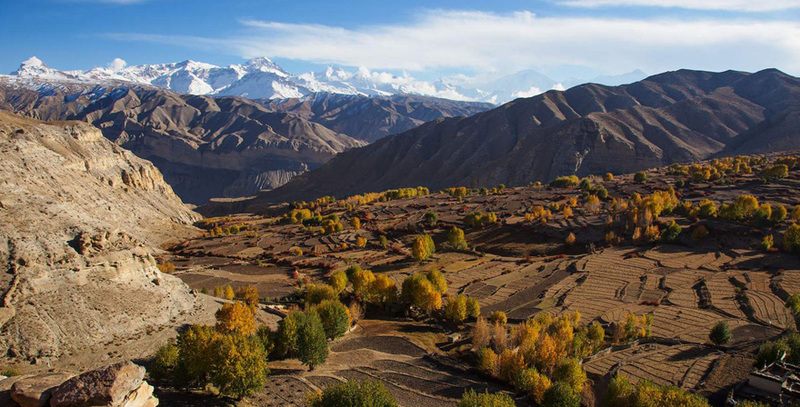 Upper Mustang Trek is a 17 days spectacular trek into the remote and ancient Trans-Himalayan salt trade route. This trek is an opportunity that you would not want to miss. It is an excellent chance to discover and explore the ethnic culture of Trans-Himalayan area influenced highly by the Tibetan culture alongside exploring the secluded villages and settlements, ancient monasteries, caves and palaces of the Mustangi kings in Mustang region. Upper Mustang Trek comprises of the high desert region of the Tibetan influence. The adventurous trek starts from world’s deepest gorge Kali Gandaki. In addition into world’s highest regions of Lo-Mangthang Valley. The steep rocky trail accompanied throughout with the views of the mystic mountains such as Nilgiri, Annapurna,etc. The thousands of years of isolation has kept the culture, lifestyle, and heritage unchanged. So as their authentic forms. Bharal Adventure offers you an exciting opportunity to observe and explore this cultural heritage in the Last Forbidden Kingdom. Bharal Adventure offers the Jeep drive tour to the trekking and Tiji Festival Trekking in Nepal in the Upper Mustang Region. The more you travel towards this forbidden Kingdom more you will be amazed to see the natural set up of the area. We will be staying at 3-star hotels in Kathmandu and Pokhara and the best available teahouses during the trek. We stay at Apsara Boutique Hotel in Kathmandu and Mt. Kailash Resort in Pokhara. All accommodations are on a twin-shared basis. Single supplement will be served on request and will cost an additional USD 390. Please understand that since you will be trekking in remote regions, the services in the teahouses will be basic. We will try our best to arrange rooms with attached washrooms; however, teahouses in some places do not have attached bathrooms. The Mustang Region is stunningly beautiful, but equally fragile. Future generations have just as much of a right to appreciate it as much as we do. Therefore, we believe that the tourism industry has an obligation to protect and preserve it. Bharal Adventure employs a 'zero impact' policy on the natural environment and the traditional communities that live there. Bharal Adventure, therefore, enforces a number of do's and don'ts. Please talk to your trek leader to avoid environmental impacts. This trek’s itinerary is planned with a high degree of awareness of AMS (Acute Mountain Sickness). 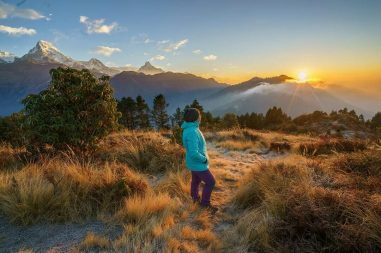 Going up at higher altitudes too fast causes a medical condition serious enough to result in death. The higher the altitude, the less oxygen will be in the air. For example, at an altitude above of 5000m, there is 50% less oxygen than at sea level. Therefore, our body needs many days to adapt to an environment with less oxygen. During this trip, we only gradually gain altitude and also spend one day in Lo Manthang which will help us acclimatize to the high altitude. Upper Mustang Trek is a moderate trek suitable for passionate walkers who have the ability to walk at least five hours a day with a light rucksack. In some days we might even need to walk for longer hours. Walking in higher altitudes is more physically demanding than walking in the lower altitudes; however, if we are in excellent health with average physical fitness, have a positive attitude and strong determination, we can accomplish the trek successfully. Exercising and jogging regularly for some weeks prior to the trip is good idea to enhance our strength and stability. Past hiking experience would be an asset but it is not mandatory. Participants with pre-existing medical conditions such as heart, lung, and blood diseases should inform Bharal Adventure before booking the trek. We also recommend that you consult your doctor(s) before the trip. This list is a guideline to help you pack for your adventure. Also, understand that the items listed below will vary a little according to the season and the trek duration. Those items marked by an asterisk are provided by Bharal Adventure inclusive in the service. The weight limit for your luggage is 33 pounds or 15 kg. Remember that your luggage will be carried by your porter but you are required to carry a day-pack (with your valuables or anything important) on your own. We also suggest that you pack only what is necessary. We take an early morning flight to Jomsom, the district headquarter of Mustang, just after breakfast. A large town, Jomsom is also a major village on the Kali Gandaki area linking the age old Trans-Himalayan Salt Trade route to Tibet. From Jomsom, we continue along the path on the Kali Gandaki riverbed for about three hours until we arrive at Eklo Bhatti village where we stop for rest. An hour of easy walk from here takes us to Kagbeni, which lies at the bank of two rivers. A major tributary of Kak Khola coming from Muktinath and Mustang Khola meets at Kagbeni from where the river is called Kali Gandaki. After getting our special permit checked, we head towards the riverbank of Kali Gandaki following the up and downhill trail until we reach Tangbe village with narrow alleys amongst white washed houses, buckwheat, barley and wheat fields and apple orchards. We trek further to Chhusang where we cross the river and head up to the huge red chunk of conglomerate fallen from the cliff above forming a tunnel through which Kali Gandaki river flows and then walk further on to a small ridge to arrive at Chele village. Starting our trek to Eklo Bhatti, we climb to Taklam-La Pass (3,624m/11,923 ft) through plateaus and narrow stretches offering pleasant views of Tilicho Peak, Yakawa Kang and Damodar Danda gradually descending a little to the village of Samar from where we climb the trail going above the village to the ridge from where it descends steeply to a stream. From here, another three hours walk will take us to Syanbochen. We shall pass through juniper trees and Ramchung Cave on our trail. Trekking uphill to Yamda-La 93,850m/12,667 ft), we pass a few teahouses, Chortens and local villages with Tibetan style houses having open veranda. Crossing the mountain passes and an boulevard of poplar trees and barley fields, we climb to Nyi Pass (4,010m/13,193 ft) and then descend to Ghaymi, the third largest village in the Lo region surrounded mostly with barren fields. Just after breakfast, we start our trek across Ghyami Khola ascending gradually to a plateau and passing along a very long Mani wall and a sacred stone wall at the end of which the trail heads east to the village of Charang surrounded by fields, willow trees and houses separated by stone walls at the top of the Tsarang Chu Canyon. Also housed here are a huge white Dzong and red Gompa. Enjoying the magnificent views of Nilgiri, Tilicho, Annapurna I and Bhrikuti Peak, we trek to Lo-Mangthang following the trail that first descends to Charang Chu Canyon and then steeply climbs up after crossing the river ascending gently to the 3,850m windy pass of Lo from where the Lo-Mangthang valley can be seen. As we descend to Lo-Mangthang, we are rewarded with the views of the magnificent walled city with its hills on the Tibetan Border. On the tenth day of our expedition, we explore the surroundings of Lo-Mangthang by visiting the Namgyal Gompa and then trekking to Tingkhar, the last main village to the northwest of Lo-Mangthang. Namgyal Gompa is situated on a hilltop and serves as an important monastery and also as a local court for the local community. You can also choose to visit the Tall Champa Lakhang “God House”, the red Thungchen Gompa, Chyodi Gompa and the Entrance Hall which are the main attractions of this town, along with the four-storey building of the Raja’s palace. As we descend from Lo-Mangthang, we take a different route walking via Gyakar which houses more than 1200 years old Ghar Gompa with Guru Rinpoche as the primary figure. This Gompa is also famous for its rock paintings and according to the legend, anyone who makes one wish at Ghar Gompa will have their wish fulfilled. We trek down exploring the area and since it is likely to be windy during the afternoon, we advice for an early start in the morning. We descend back to Ghiling walking about five to six hours down the hill where upon arrival we enjoy our lunch and spend rest of the day exploring the area. Since it will be windy in the afternoon, it is advised that you take walk during the evening. Retracing our steps back to Ghiling, we walk along the rough trail with beautiful Himalayan backdrop for about five to six hours. We start early on this day as we trek to Kagbeni along the Upper Mustang trails first gradually joining the Annapurna Circuit trail. At Kagbeni, we will have our lunch and from here we head to Jomsom where we will stay for a night. If you can spare another day, you can take a guided trek to Muktinath from here as well. On this day, we fly back to Pokhara in a morning flight. Upon arrival at Pokhara, we take rest for a while and head out to explore the tranquil beauty of the Pewa Lake. We can also go to World Peace Pagoda or explore other lakes in this beautiful lake city. 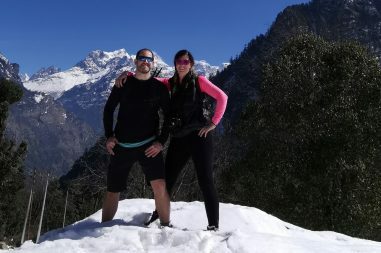 Annapurna Circuit Trek is the best detour of Himalayan walking holiday. 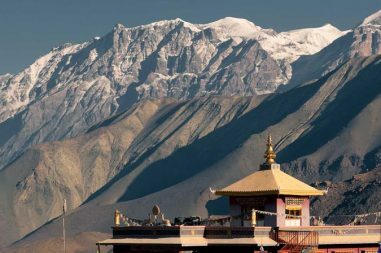 The trail encompasses popular high pass of Thorong La as the well religious destination of Muktinath.